DETROIT COLLEGE OF LAW DETROIT, MICHIGAN art picture photo print photograph for sale. 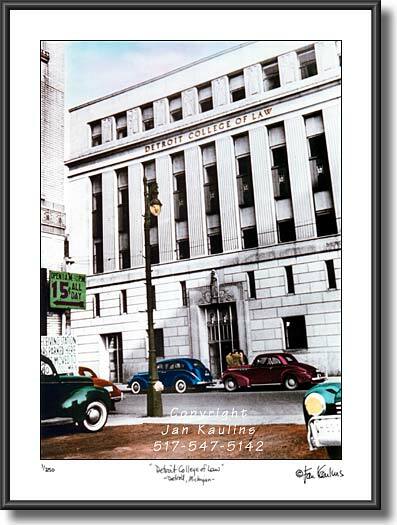 DETROIT COLLEGE OF LAW photograph pictures prints fine art photography for sale : This Detroit College of Law DCL photo picture print for sale is made from a hand-colored black and white rare historical picture photograph of The Detroit College of Law in The City of Detroit Michigan in 1941. The Detroit College of Law, DCL, was established in 1891 and was the first law school in the Detroit area and only the second law school in the State of Michigan. In this Detroit College of Law photograph is pictured the historic Detroit building, on West Elizabeth St., in downtown Detroit Michigan. The Detroit College of Law building was demolished to make way for the Comerica Park project and the Detroit College of Law moved to MSU in East Lansing. This archival DCL Detroit College of Law picture photo shows the front of the Detroit College of Law building with vintage cars parked in the front, and sign for 15 cents for all day parking! Since the Detroit College of Law building has been torn down, this Detroit College of Law picture photograph print would be a wonderful and very unique memento for any DCL graduate or member of The Detroit College of Law Alumni Association.